German rabbi and lexicographer; born May, 1819, at Dabrzyze, Posen; died at Breslau Feb. 27, 1892. Having received his Talmudic education from his father, Isaac Levy, who was district rabbi at Schildberg, and from Akiba Eger, he entered the Matthias Gymnasium at Breslau, after leaving which he studied philosophy and oriental languages at Breslau University, and received his doctor's degree from the University of Halle in 1845. He accepted a call to Rosenberg, Upper Silesia, where he officiated as rabbi until 1850. Wishing to live in an intellectual center, he moved to Breslau without any prospect of employment. In 1857 he became associate rabbi of the Breslau community; in 1864 he was appointed admonitor to the local court, his duty being to admonish the Jews who had to take the oath "More Judaico"; and in 1878 he was appointed instructor at the Mora-Salomon Leipziger Stiftung, an office which he continued to hold till his death. Levy published in 1867-68 at Leipsic his "Chaldäisches Wörterbuch über die Targumim" (3d ed., ib. 1881), with notes by Prof. H. Fleischer. In recognition of this work the Prussian ministry granted him in 1875 the title of "Königlicher Professor." His chief work, however, is his "Neuhebräisches und Chaldäisches Wörterbuch über die Talmudim und Midraschim" (with notes by Fleischer; 4 vols., ib. 1876-89). 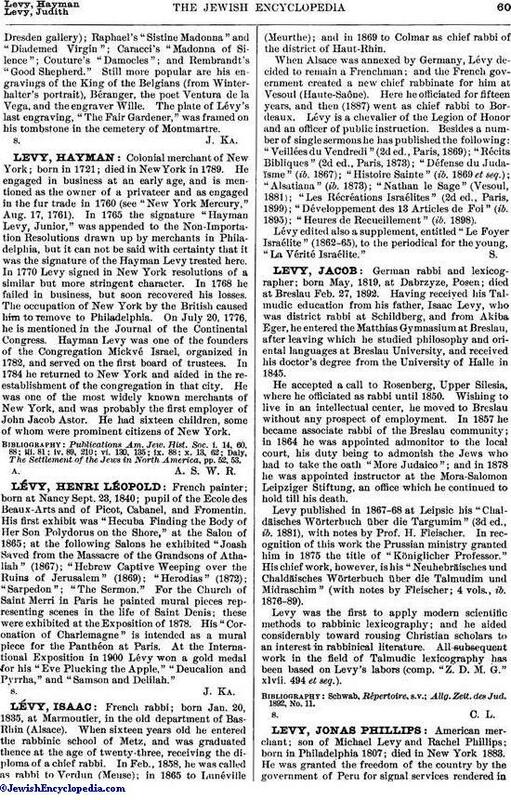 Levy was the first to apply modern scientific methods to rabbinic lexicography; and he aided considerably toward rousing Christian scholars to an interest in rabbinical literature. All subsequent work in the field of Talmudic lexicography has been based on Levy's labors (comp. "Z. D. M. G." xlvii. 494 et seq.). Allg. Zeit. des Jud. 1892, No. 11.